Find out everything you need to know on the new Land Rover Range Rover Evoque from independent vehicle review website Car And Driving. You can watch the video review to the left to see more of the car or read their written review below to get a true insight from an expert in the automotive industry. Range Rover's Evoque has demolished all sales records for SUVs in this class. Jonathan Crouch reports on how the latest version aims to stay in the top spot. 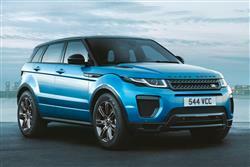 The Range Rover Evoque accounts for a third of the brand's total sales. It's a fashionable, yet capable proposition that has fundamentally changed the premium compact SUV market and rivals now have to contend with an evolved version that features a more efficient range of engines, extra technology and even, uniquely in this sector, the option of a Convertible bodystyle. As a result, if you want an SUV of this kind, this is still the one to beat. If rival manufacturers were hoping that the success of the Range Rover Evoque was about to let up, they've been disappointed. Land Rover has kept its premium compact SUV on top of its game with a whole series of significant updates - and these have come not so long after a previous series of changes that introduced the car's segment-leading nine-speed ZF auto gearbox. This time round, the Evoque's looking to stay on top of the pile courtesy of some styling updates, some fresh engines and a range of improved safety kit. Is it enough? Nobody's really got to within touching distance of the Evoque in terms of desirability in its division, so we're going to go out on a limb and say yes. It's really not that much of a punt. It's a brave new world at Land Rover right now thanks to a range of 2.0-litre Ingenium engines that look to put the company on a similar efficiency footing as the best of the Germans and Japanese. The Evoque gets the aluminium Ingenium diesel engine, built at the company's shiny new £500m Engine Manufacturing Centre in the West Midlands. This TD4 unit is 20-30kg lighter than its predecessor and delivers low levels of vibration and noise intrusion. It's offered to Evoque customers in two states of tune: 150PS in the economy-oriented eD4 front-wheel drive model, and 180PS if you prefer a bit more poke and can't do without all-wheel drive. Should you want to go faster still, you can buy the Evoque with the punchy 240PS Si4 petrol unit, but we'd prefer the Ingenium 2.0-litre 190PS powerplant. This propels the car to 60mph in just 6 seconds, making it the fastest sprinting Evoque to date. The nine-speed ZF transmission is fitted to petrol models and shifts between gears so quickly that ZF reckons it's "below the threshold of perception". An adaptive shift programme quickly matches the driving style and includes a memory function. A Torque Vectoring by Braking feature further enhances agility and safety by redirecting torque to counteract understeer. Off-road ability is enhanced with the fitment of All-Terrain Progress Control. This function maintains a pre-determined speed - selected using the cruise control function - in forward or reverse gears between 1.1mph and 19mph, allowing the driver to concentrate on negotiating tricky terrain. Not many cars make it from concept Motorshow prototype to production reality without being significantly watered down - but this was one of them. We first saw what was then called the LRX in 2008 and the Evoque model it then became is as arresting to look at now as it was back then, whether you opt for this Five-Door bodystyle or the Coupe or Convertible three-door versions. Inside, Glistening switches and dials from pricier Range Rover models are surveyed from beautifully upholstered sports seats which on plusher models are trimmed in perforated 'Oxford' ebony leather. Land Rover has delivered a state-of-the-art infotainment screen to its volume buyers. The 8-inch 'InControl Touch' display is clear, easy to navigate around and very informative. Plus the brand has also developed a larger 10.2-inch 'InControl Touch Pro' screen that's standard for Convertible Evoque buyers. In the rear, the shallow side windows create a bit of a 'hemmed-in' feel but overall, the space on offer is surprising when you consider the rakish roofline and the fact that this car is shorter than a Ford Focus. There's a 575-litre boot in the five-door version - or 550-litres in the three-door. When required, luggage capacity can be expanded to a healthy 1,445-litres in the five-door. The three-door manages 1,350-litres with the seats folded. As before, pricing starts at around the £30,000 mark and there's a choice of either a five-door bodystyle or the three-door 'Coupe', both derivatives equally priced (though the Coupe offers a slimmed-down model range). As for spec, well Land Rover trim levels have often chopped and changed with quite dizzying regularity, so it's good to see that the company has at last introduced some measure of consistency across models. Gone are the old Pure, Prestige and Dynamic models and in comes some trim levels aligned to match those of the Range Rover Sport: SE, SE TECH, HSE Dynamic, HSE DYNAMIC LUX and Autobiography. Even the base trim is well equipped, with the SE featuring an eight-inch InControl Touch touchscreen infotainment system. This allows users to swipe between screens just like a smartphone. If necessary, the six-speaker stereo system can be upgraded to include SD-card based satellite navigation, with DAB radio featuring as standard across the range. Step up to the HSE Dynamic or Autobiography models and you get InControl Touch Plus, which comprises HDD-based navigation, a rear-seat entertainment system complete with a pair of eight-inch video screens and wireless digital headphones, and an 11- or 17-speaker Meridian audio system. A hands-free tailgate function of the type where you wave a foot under the rear bumper has also been offered. Safety features available include Lane-Keeping Assist, which uses a stereo digital camera, and Autonomous Emergency Braking (AEB) which prevents low-speed rear-enders. Attention Assist Estimation sounds audible alarms and visual warnings signal if it thinks the driver is showing signs of drowsiness. One of the biggest drivers for this Evoque's development is to improve efficiency. The all-aluminium diesel engine delivers fuel economy of up to 68mpg and low carbon dioxide emissions from just 109g/km in front-wheel drive guise. Even if you choose the more powerful 180PS unit, it'll still manage 59 miles from a gallon of derv with CO2 emissions from 125g/km. The 150PS entry-level diesel is some 18% more fuel efficient compared to its predecessor. That's a huge advantage. Land Rover has included variable valve timing and a series of low friction technologies. Selective catalytic reduction and low-pressure exhaust gas recirculation system significantly reduce NOx emissions. Even the 240PS petrol engine doesn't do too badly on the juice, returning 36mpg on the combined cycle with emissions of 181g/km. That hasn't changed from the old car though. The Range Rover Evoque also adopts low CO2 systems such as Electric Power-Assisted Steering and is built to maximise end of life recyclability. With such high demand and a distinctly finite plant capacity at the Halewood factory, residual values have remained very strong. It aces the Audi Q5 on residuals to such an extent that a comparable Audi costs more than 20 per cent more to run over a typical three-year ownership tenure. Land Rover has spent its money wisely in continuing to update this Evoque. The engine range has come in for the lion's share of the attention recently and it's an investment that ought to keep the Evoque at the top of the class for some time to come. Thanks to Ingenium engineering, the car has become significantly more economical, yet it remains extremely capable, both on road and off. Just about the only thing that can really sink this model is for it to go horribly out of fashion. That doesn't look like happening any time soon, but just in case, Land Rover has concentrated on substance over style with the most recent revisions. In doing so, the brand has future-proofed its biggest money-spinner.